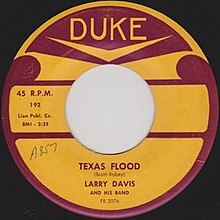 "Texas Flood" (sometimes called "Stormin' in Texas" or "Flood Down in Texas") is a blues song recorded by Larry Davis in 1958. It is considered a blues standard and has been recorded by several artists, including Stevie Ray Vaughan, who made it part of his repertoire. Although Davis later became a guitar player, for "Texas Flood" Fenton Robinson provided the distinctive guitar parts, with Davis on vocals and bass, James Booker on piano, David Dean on tenor saxophone, Booker Crutchfield on baritone saxophone, and an unknown drummer. The song was Davis' first single as a leader and became a regional hit. According to Clifford Antone, Stevie Ray Vaughan was introduced to "Texas Flood" by Angela Strehli at Antone's Austin, Texas club, where the three of them worked out the song. Vaughan drummer Chris Layton recalled that Albert King brought Larry Davis to the club several times, where Vaughan was attracted to the "intriguing guitar parts". In 1983, Vaughan recorded "Texas Flood" for his debut album, also titled Texas Flood. He followed Davis' song, although he added several twelve-bar sections of improvised guitar soloing, which nearly doubled the length of the song and provided a showcase for his electric guitar style. Although Vaughan performed it in the fingered key of G, he tuned his guitar one-half step lower resulting in a pitch of G flat. Vaughan recorded several live versions of "Texas Flood" during his career, which appeared on such albums as Live Alive (1986), Live at Montreux 1982 & 1985 (released 2001), Live in Tokyo (1985, released 2006), and the videos Live at the El Mocambo (1983, released 1991) and Live from Austin, Texas (1983, released 1995). Vaughan's version is listed at number 66 by Rolling Stone magazine in its "100 Greatest Guitar Songs of All Time"
Numerous blues and other artists have recorded "Texas Flood", including original guitarist Fenton Robinson on his album Somebody Loan Me a Dime (1974), Buddy Guy from Breaking Out (1980, released 1988), and Willie Nelson from Milk Cow Blues (2000). Albert King reworked the song as "Floodin' in California" for his album San Francisco '83, which was re-released as Crosscut Saw: Albert King in San Francisco (both 1983). ^ Herzhaft, Gerard (1992). Encyclopedia of the Blues. Fayetteville, Arkansas: University of Arkansas Press. p. 472. ISBN 1-55728-252-8. ^ Morthland, John (1992). The Best of Duke-Peacock Blues (Album notes). Various artists. MCA Records. p. 11. MCAD-10667. ^ a b Gregory, Hugh (2003). Roadhouse Blues: Stevie Ray Vaughan and Texas R&B. Backbeat Books. p. 79. ISBN 978-0-87930-747-9. ^ For a while, Larry Davis played bass for Albert King. ^ Rolling Stone (2003). "100 Greatest Guitar Songs of All Time". Rolling Stone. Archived from the original on 2008-05-30. Retrieved September 26, 2016. Original 1983–1989 releases are marked in bold. "The Sky Is Crying"/"Chitlins con Carne"
This page was last edited on 17 December 2018, at 23:01 (UTC).